A total lunar eclipse will be visible throughout North and South America on Sunday night. KNAU’s Melissa Sevigny reports on the best time for Arizonans to watch the moon plunge into Earth’s shadow. Earth’s shadow will take the first bite out of the moon at eight thirty in the evening, as it rises in the eastern sky. The eclipse will end just before midnight. But the best part of the show, when totality occurs, is between 9:40pm and 10:40pm. At that time the moon will be completely covered by Earth’s shadow and will turn a coppery red. That’s because it’s faintly illuminated by sunlight that filters through Earth’s atmosphere and bends into the shadow. 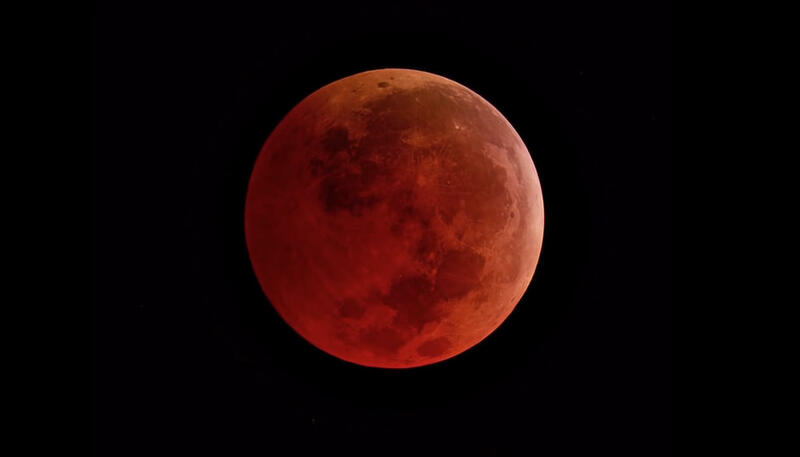 The red color of the eclipse gives it the nickname “blood moon.” It’s also a “super moon,” meaning it’s a little closer to Earth in its orbit than usual and appears extra big and bright. There won’t be another total lunar eclipse anywhere in the world until the year 2021. Cloudy weather? Here’s a live stream of the eclipse. Partial umbral eclipse begins: 8:34 p.m.
Total lunar eclipse begins: 9:41 p.m.
Total lunar eclipse ends: 10:43 p.m. Partial umbral eclipse ends: 11:51 p.m.
A total lunar eclipse will be visible tomorrow (Jan. 31) before dawn. It’s taking place during an unusual time in the lunar cycle, giving it the name of a “super blue blood moon”. KNAU’s Melissa Sevigny reports.